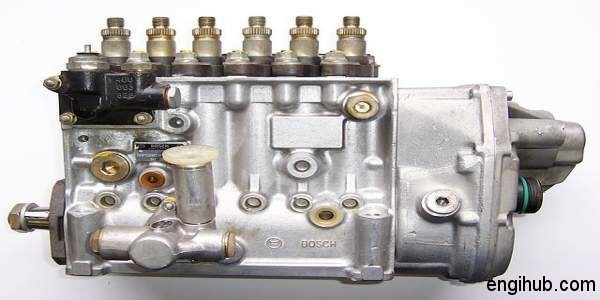 Fuel Injection Pump is another important part of fuel injection system in automobile engineering. The Fuel Injection Pump is used in the individual pump system of a solid injection. It consists of a plunger driven by a cam and tappet mechanism at the bottom. Here in this post, I will like to share the detail information on fuel injection pump with you. The plunger reciprocates in the barrel. The quantity of plunger varies with the number of the cylinder in the engine. The plunger has a rectangular vertical groove which extends from the top to another helical groove. The delivery valve can be lifted off its seat under the pressure of the liquid fuel. And also against the force of the spring. The passage is connected to the fuel atomizer. When the plunger is at the bottom of its stroke and supply as well as spill ports are uncovered. The oil from fuel feed pump, after filtration, is forced into the barrel. The supply and the spill port are sealed at a certain stage when the plunger is pushed away. This is done with the help of cam and tappet mechanism which is provided at the bottom. During the further movement of the plunger, the fuel above it gets compressed and the high pressure developed. It lifts the delivery valve off its seat and fuel starts flowing through the passage to the atomizer. As the plunger rises up still further, at a particular moment the helical groove connects the spill port through the rectangular vertical groove, to the fuel in the upper part of the plunger. Consequently, there is a sudden pressure drop due to which the delivery valve falls back on its seat under the force of spring. This increases the volumetric capacity of the delivery system resulting in sudden pressure drop in the delivery pipe. Thus the discharge from a nozzle of the injector is cut off suddenly. Hence the fuel is prevented from dribbling into the cylinder even after the injection ceases. The cycle is repeated frequently. During each stroke of a plunger of Fuel Injection Pump, the duration of the delivery is more or less. According to the spill, a port is made to communicate, earlier or later, with the high-pressure fuel in the upper part of the barrel. This depends upon the position of the helical groove which can be changed by rotating the plunger with help of rack. When engine at full load, the position of the helical groove on the plunger is kept below the passage. At partial load or normal delivery, the plunger of Fuel Injection Pump is rotated to a position nearby passage, in which the delivery takes place for the shorter period. When the engine is stopped, the plunger of Fuel Injection Pump is rotated to the position where the helical groove is opposite to the passage, in which rectangular slot is in line with the spill port. 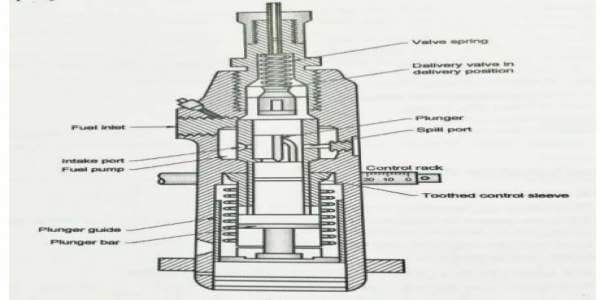 There is no pressure built up above the top of the plunger, the delivery valve is not at all lifted and hence no delivery of fuel to the atomizer takes place. The bore of the pump ranges in eight sizes from 5 mm to 10 mm but the stroke of the plunger is standardized at 9 mm. I hope, with these details of Fuel Injection Pump you can open and see the actual fuel injection pump without any doubt.